Hunter S. Thompson was one of my influences back in college after I read his “The Boys on the Bus” along with numerous articles in the Rolling Stone Magazine. 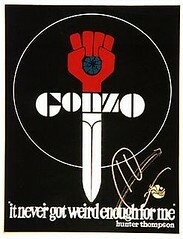 But as I found out in my ‘WoMan on the Street‘ interviews, I wasn’t the only Gonzo fan. Thompson shared a large part of San Francisco’s history during the ‘Summer of Love’ along with his writings for the Rolling Stone Magazine when it was headquartered in San Francisco in the early 1970s. And those young and young-at-heart came out to pay homage to their ‘hero’. Most of the people I talked to agreed that his wisdom rings true in today’s politics……. I wonder what he would have said about our current Presidential race? SUBSCRIBE TO THE LATEST PROGRESSIVE PULSE BLOG FEEDS!